The submarine exhibits of the the Navy Museum in Washington include four World War II-era unofficial submarine battle flags. Images are available at history.navy.mil/faqs/faq62-1.htm, the Navy Historical Center's site. What's not on the site is a new addition to the collection that revives the World War II tradition: the battle flag of USS Louisville. I believe Louisville's Tomahawk missile launches in Operation Desert Storm in 1991 constituted one of the first--if not the first--U.S. Navy submarine war patrol since 1945. Louisville's battle flag is navy blue with a gold fringe (notwithstanding that it is made with grommets to fly from a halyard). On the center is a badge showing a black submarine sail outlined in white set within a golden horseshoe (emblematic of the horse-racing traditions of Louisville, Kentucky). Across the top is the name of the ship and across the bottom, two lines reading "SSN 724" and "WAR PATROL JAN 91". In the upper hoist is the gold dolphins badge of a submarine officer and in the lower fly the silver dolphins badge of an enlisted submariner. In the upper fly is an emblem showing a map of the Persian Gulf region inscribed "Operation Desert Shield" and in the lower hoist the same emblem inscribed "Operation Desert Storm." Finally, in the center of the hoist is a red ring surrounding an Iraqi flag, both surmounted by a gray Tomahawk cruise missile. The USS Nautilus (SSN-571) was the world's first operational nuclear-powered submarine and was named for the submarine in Jules Verne's "Twenty Thousand Leagues Under the Sea", the Nautilus was authorized in 1951 and launched in 1954.
www.csp.navy.mil/asl/ScrapBook/Boats/Providence2008.jpg (source: www.csp.navy.mil/asl/Submarines.htm) (three flags from left to right: SSN-719 (USS Providence flag), Submerged Polar Transit flag (1958) flag displayed in color and SSN-571 (USS Nautilus flag), during USS Providence's trip to the North Pole in 2008 to commemorate and re-enact the 1958 journey by the USS Nautilus. 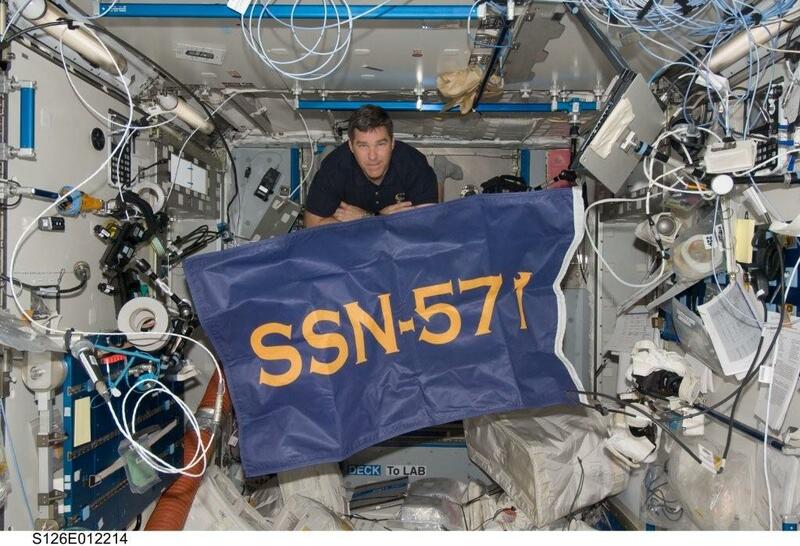 www.nautilus571.com/Images/space_flag.jpg (source: www.nautilus571.com/nautilus_flag_space.html) (flag of SSN-571 flown into space in 2009: the very same flag that was carried by the USS Providence to the North Pole in 2008).